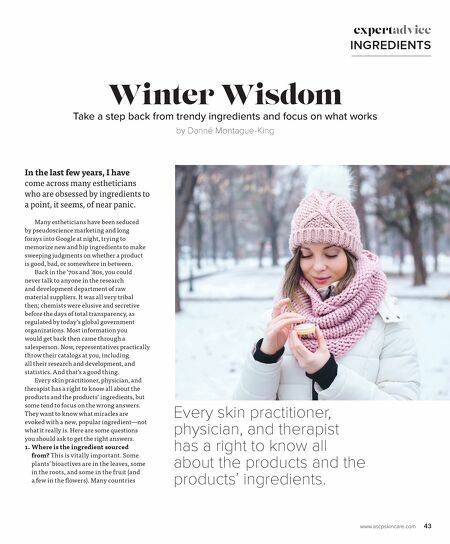 www.ascpskincare.com 43 Winter Wisdom Take a step back from trendy ingredients and focus on what works by Danné Montague-King In the last few years, I have come across many estheticians who are obsessed by ingredients to a point, it seems, of near panic. Many estheticians have been seduced by pseudoscience marketing and long forays into Google at night, trying to memorize new and hip ingredients to make sweeping judgments on whether a product is good, bad, or somewhere in between. Back in the '70s and '80s, you could never talk to anyone in the research and development department of raw material suppliers. It was all very tribal then; chemists were elusive and secretive before the days of total transparency, as regulated by today's global government organizations. Most information you would get back then came through a salesperson. Now, representatives practically throw their catalogs at you, including all their research and development, and statistics. And that's a good thing. 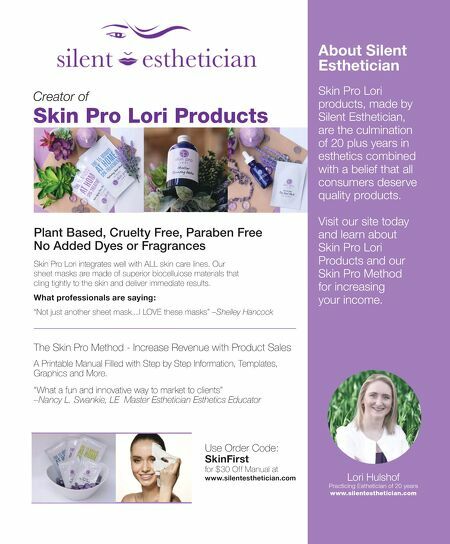 Every skin practitioner, physician, and therapist has a right to know all about the products and the products' ingredients, but some tend to focus on the wrong answers. They want to know what miracles are evoked with a new, popular ingredient—not what it really is. Here are some questions you should ask to get the right answers. 1. Where is the ingredient sourced from? This is vitally important. Some plants' bioactives are in the leaves, some in the roots, and some in the fruit (and a few in the flowers). Many countries expertadvice INGREDIENTS Every skin practitioner, physician, and therapist has a right to know all about the products and the products' ingredients.